Attended an evening party and was wearing a 20’s style flapper dress, so I thought I’d do a dark smoky-eye, but reminiscent of the 20’s doe-shape, rather than the modern winged-out cat-eye one. It might not look all that apparent, but it does create a rounder eye and a more doll-like expression, by deliberately applying strong color on the inner part of the socket line. This was done by priming the lids, applying a layer of matte black shadow within the lid area, then a metallic dark gray to shade that up and into the socket. not to contour your socket line with the darker shadow. 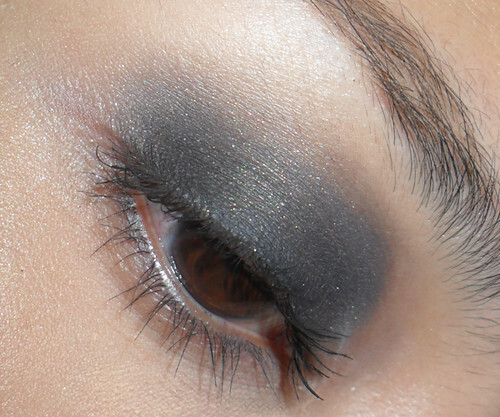 The color is darkest around the lashes and center of the lids, then fades outward in a more rounded shape. to bring the color downwards at the outer corners of the eyes (instead of winging up and out) so that it peaks at the center of the lid, and toward the nose. not taking the color too far into the inwards that you hit the sides of your nose. This keeps the look modern and more wearable. you do not have very hooded eyes, close-set eyes, or an eye shape that is already drooped downwards at the outside corners.